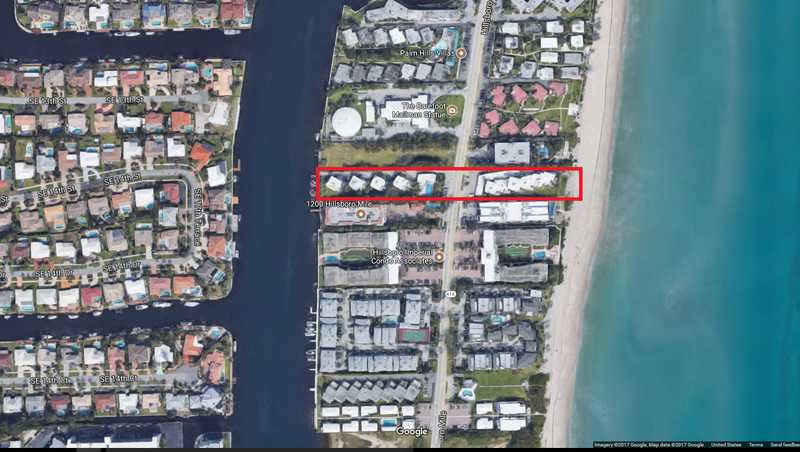 The Shoreland at 1202 - 1203 Hillsboro Mile in Hillsboro Beach stretch on both sides of A1A. 1202 is located on the West side (intracoastal) and 1203 is located on the East side (ocean). They were both built in 1958 and have about 25 units each over 3 stories. Shoreland condominiums for sale are nestled on an exclusive three-mile stretch of South Florida’s coast – a private getaway in between Boca Raton and Ft. Lauderdale deemed “The Mile.” This private oceanfront escape is discreetly located away from the hustle and bustle of city life, maintaining a certain serenity only available to those who are lucky enough to find a home there. Learn more about what makes Shoreland condos an exceptional place to live, or browse through some of our listings below. Depending on your unit, you can either be facing the ocean and the beach or the intracoastal. The units are usually 890 - 1,100 living sqft, 2 bedrooms and 2 baths for around $500,000. Shoreland condos provide a pool on the intracoastal side, access to a private beach, elevator and manager on site. As your Shoreland condo real estate agent, Jean-Luc Andriot of the Boca Premier Property Group can assist you with all of your home-buying and selling needs. We can provide you with access to the local listings database and offer our experience and knowledge to make the process for you and your family the best that it can be. Contact Jean-Luc Andriot today to get your home search started.